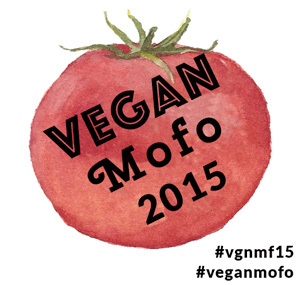 The Vegan MoFo prompt of the day is: Make (or eat) a traditional local dish. Since I live in a town with one of the largest Indian populations in America, we have an array of Indian cuisine at our disposal. In particular, the South Indian food sticks out to me the most, as I feel like most Indian restaurants in America specialize in North Indian cuisine. As I mentioned, South Indian cuisine tends to use more rice. These dosas exhibit just that, as they are made from fermented rice and lentils. There is a little hole-in-the-wall restaurant in my town that serves South Indian street food, such as pav bhaji, vada pav, and dosas galore. This is my tribute to them. Their dosas are crisp and massive, about the size of a piece of paper. My dosa skills are still being honed, so therefore mine are about the size of your hand. Maybe one day I will achieve massive dosa madness. Below is the dosa batter, pre-ferment. Here it is after sitting in my oven overnight. It puffed up, became somewhat more solid, and developed little air bubbles all over the top. 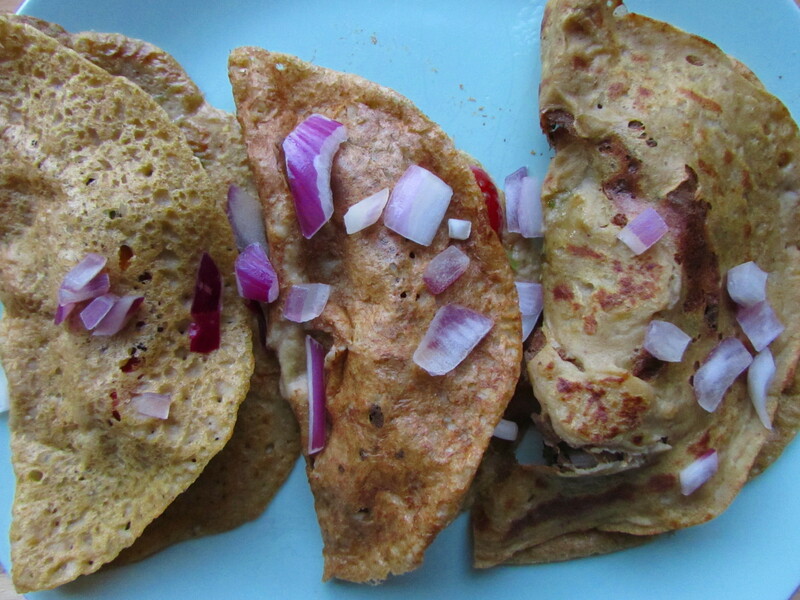 I decided to make these dosas with a bit of sweet potato puree incorporated into the batter. As I am madly in love with those orange gems, I figured this would be a great addition. Maybe the dosas would be lightly sweet and nutty. Well… sorry to burst my own bubble, but it honestly didn’t add any flavor. Womp. That’s not to say they tasted bad – not at all; they were delicious! – it’s just saying that they didn’t taste like the glorious, crisp sweet potato heaven of my dreams. Your batter should be thin enough to pour in a stream. Otherwise, the dosa will be too thick and be more of an uttapam. Dosa in action. Mmm, nice and crispy. The trick is to quickly run the ladle around in a circle to spread out the batter as soon as you pour it on the skillet. Also, as I allude to above, making small ones is definitely a good beginner’s way to go. 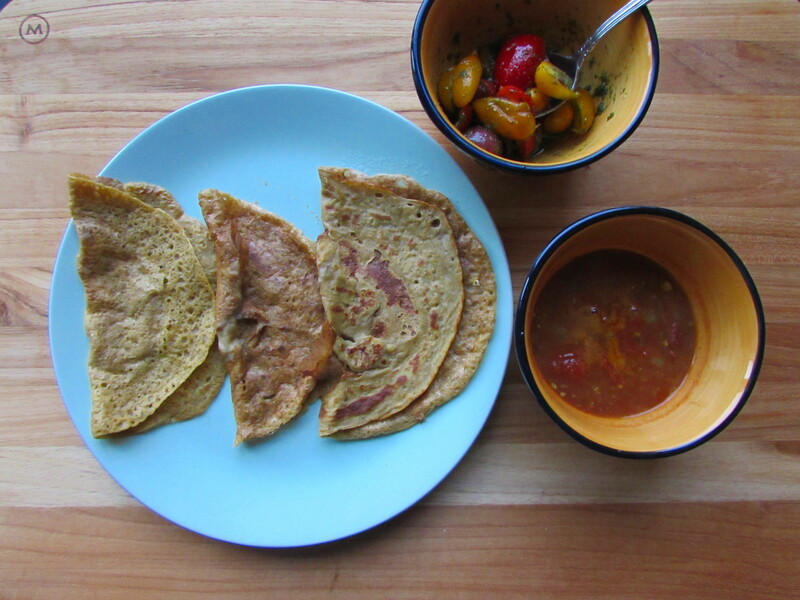 I served my dosas with homemade Rajma (recipe from Vegan Richa’s cookbook), and some colorful tomatoes coated in cilantro-mint chutney (chutney recipe also from Vegan Richa’s cookbook). First, separately wash and drain the urad dal and split yellow peas, and the rice. Then, place the urad dal and split yellow peas in one bowl and cover with water. Add the fenugreek seeds to this bowl. Place the rice in one bowl and cover with water. Let these soak overnight. Drain the rice and dals. Pour the rice and dals into a high-powered blender and add in 1 cup water. Blend on high until the mixure is smooth. (If you do not have a high-powered blender, you should blend the rice first with 3/4 cup water, and then the dals, with 1/4 cup water). Place this batter into a large bowl. Stir in 1/2 tsp salt. 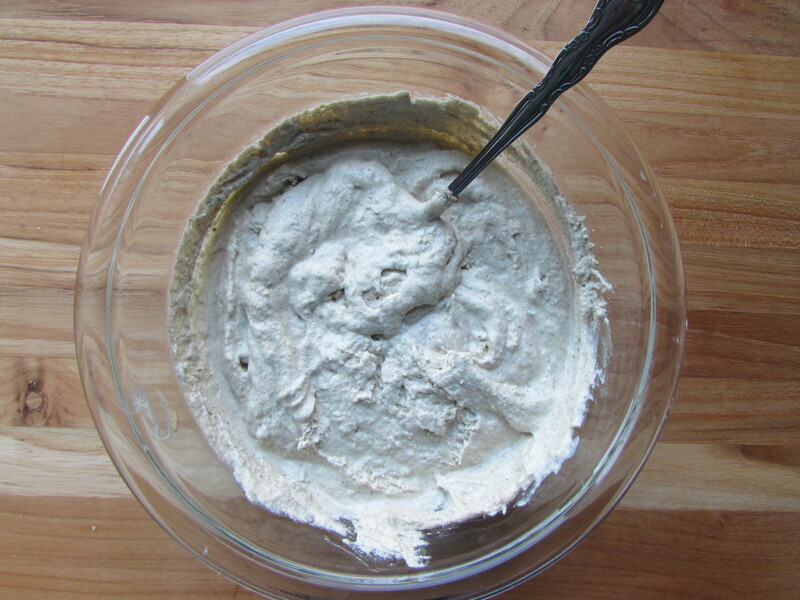 Cover the batter loosely, either with a towel or some loose plastic wrap and place in a warm spot to ferment. I have a gas stove that maintains pilot lights, so I just stuck mine in the oven, which is perpetually warm. If you don’t have this, just leave the bowl on top of the fridge, or in an oven with the light on. Let the batter ferment for 8-24 hours. 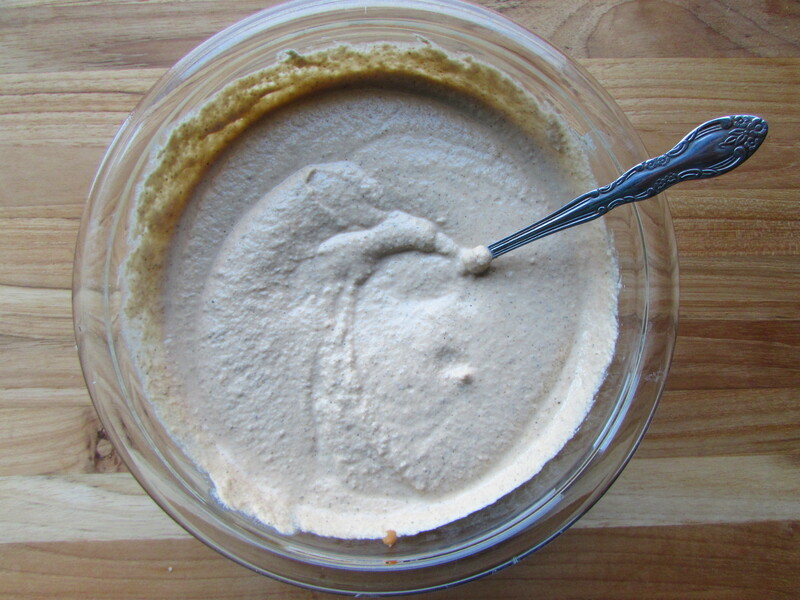 When you look at the fermented batter, it will have risen, have tiny holes throughout, and smell fermented (slightly sour). 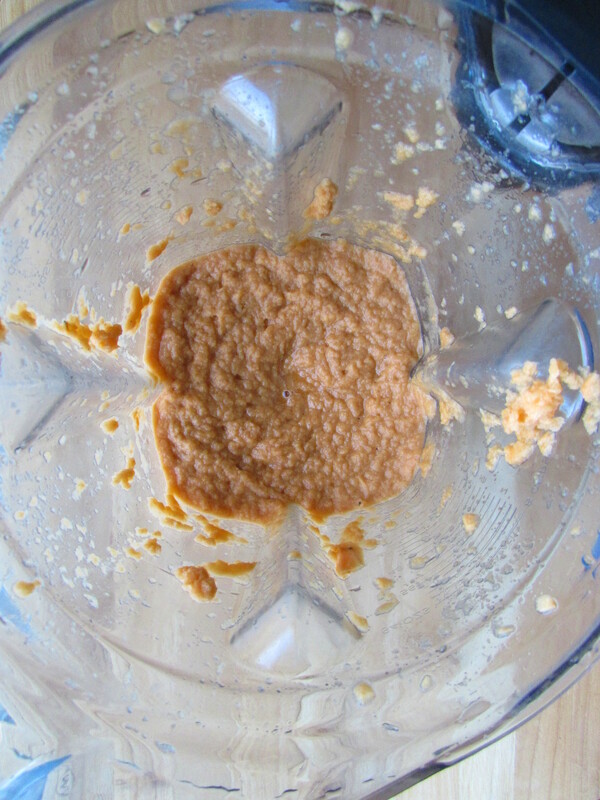 Puree your sweet potato chunks in a blender. Add the puree to the fermented dosa batter and stir to incorporate. When you are ready to make dosas, scoop some of the dosa batter into a smaller bowl for a consistency check. Is the batter able to be poured in stream? If not, add more water. 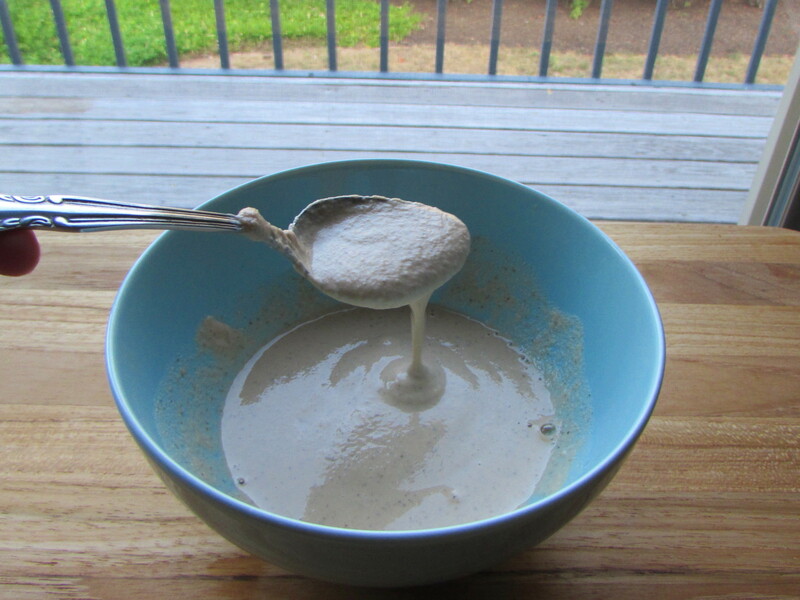 Keep adding small amounts of water until the batter is thick, but still able to be poured in a stream. If it becomes too watery, just add some more batter. Heat a large skillet oven medium heat. Spray the skillet with oil. Ladle in 1/4 cup batter on the skillet. 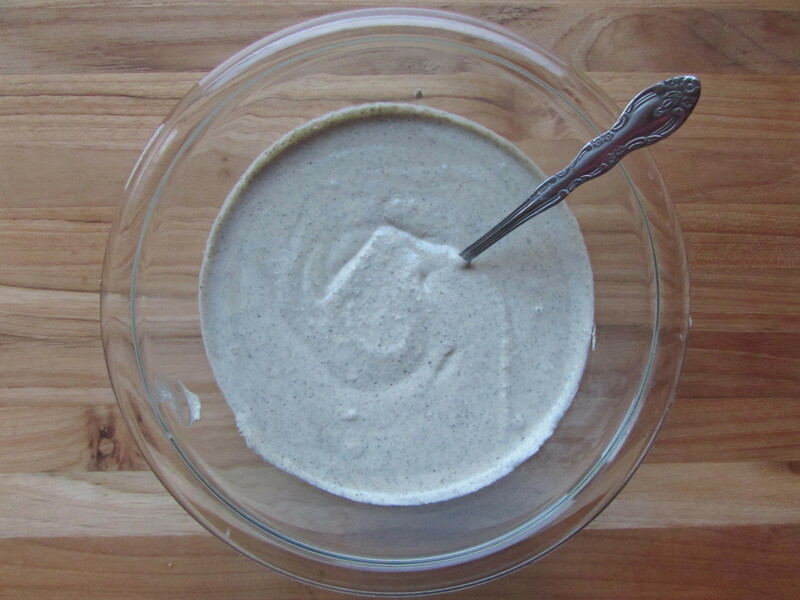 Quickly spread batter around in concentric circles using the ladle. 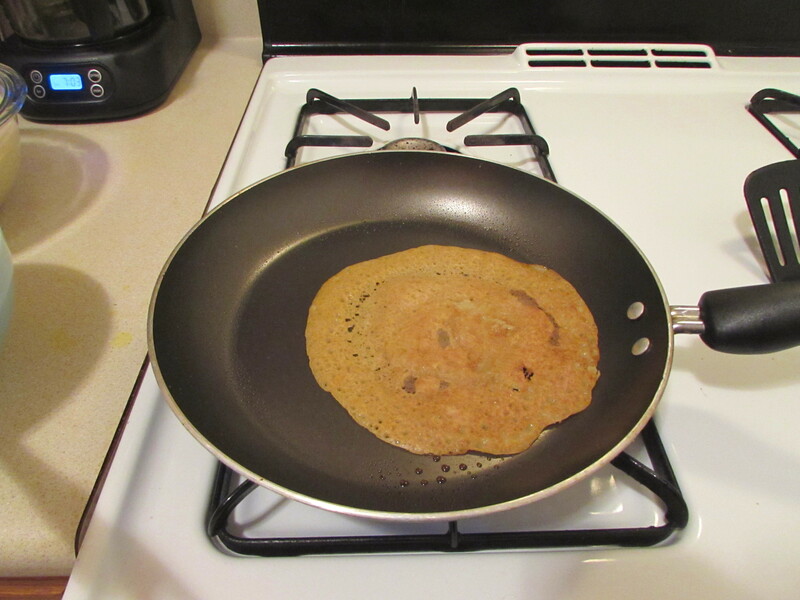 Cook for 3 minutes, or until dosa is golden brown on bottom. Flip and cook for 2 more minutes. Taste this dosa and make sure it is the consistency and flavor you want. If not, adjust salt and/or thickness. Make the remaining dosas that you would like to serve. Keep the rest of the batter in the fridge for later use. Batter stays good in the fridge for 1-2 weeks. The classic way to serve dosas is with a spiced potato filling. 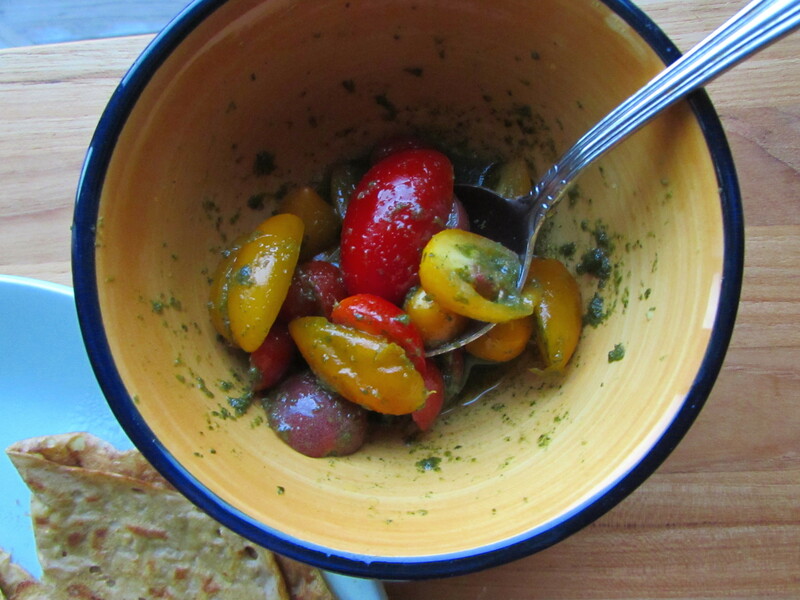 I served these with tomatoes tossed in mint-cilantro chutney. There are endless options! Notes: 1) You can find urad dal, chana dal, and split yellow peas in an Indian grocery store. You really need urad dal to make these ferment. If you can’t find it, you may need to replace it with a different lentil and add a bit of yeast to help the process along. 2) You can make uttapam if you are having a hard time making dosas. Just leave the batter quite thick and have the batter cover the bottom of the skillet, like an omelette. You will need to let it cook longer. 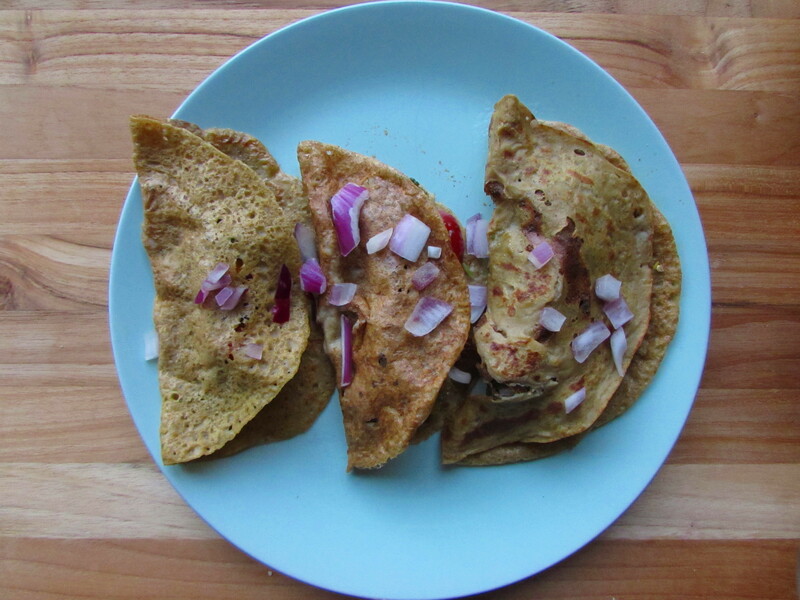 Feel free to top the uttapam with minced onion and tomato. Great dosas – even if the sweet potato wasn’t prominent enough for you. They look great and look nice and crisp. I’m sharing this post on Vegan MoFo Blog Round Up. Thanks!